Avoid the dreaded "rat's nest" of cables and equipment with these quick tips on AV rack design. As I work on AV system design and installation projects at various college campuses, there's always one area that plagues everyone: poorly designed and installed equipment racks. It seems like a basic concept, but it can be a real pain point when done wrong. We've all opened up an equipment rack or lectern to see a rat's nest of cables inside. Like most aspects of installed AV systems, when it's done right most people don't notice it. But when it's done wrong, it's hard to miss. Rack design/building can be a real art: There's a reason there used to be a rack building competition at the InfoComm Show. Paying attention to some basic rack design concepts early in the project's timeline can prevent a handful of issues you'll have to address in the future. Per my usual disclaimer, any specific products I mention are simply products I prefer to use, and I have no affiliation with those manufacturers. The first thing that comes to mind when talking about proper rack building is cable management. Every field technician knows that disastrous AV equipment rack on campus that he's scared to open. Cables are everywhere inside, and it takes 15 minutes of tracing balls of cables to determine the system's signal flow. When your field tech is responding to a trouble call while a class is in session, that's valuable time wasted that could have been prevented with some simple cable management tactics. Using some inexpensive rack components like horizontal lacing bars (on rear rack rails) and vertical lacing strips allows the rack installer to bundle and secure cables with Velcro strips. Plastic zip ties are best avoided since they pinch and compress the Category cables that are often used in modern AV systems, and Velcro strips are easier to remove and reinstall if you need to swap out a cable. If you're still using plastic zip ties, make sure they're trimmed flush, so the rack isn't full of little razor blades for the poor field tech who needs to service the rack. As cables are bundled, rack designers and installers need to be implementing InfoComm's best practices of signal separation in racks. 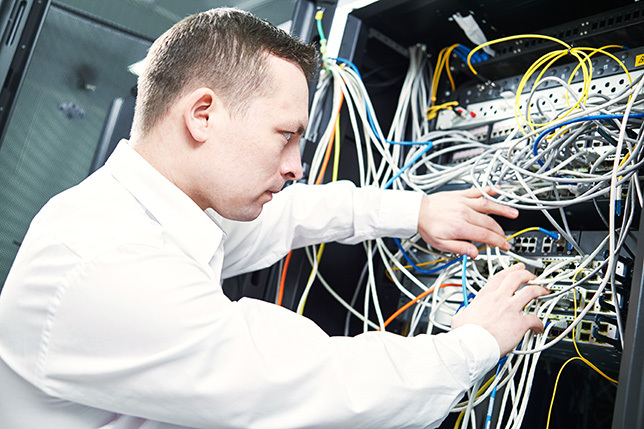 Make sure to pay attention to concepts like sufficient service loop length and connector stress when bundling and dressing cables. As AV-over-IP designs become more prevalent in modern AV systems, we're finding larger network switches being installed in AV equipment racks. Using these switches means that rack designers need to pay a bit more attention to cable management. Many network switches have front-facing ports, as opposed to the typical rear-facing ports/connectors on traditional AV equipment. AV rack designers need to include front-facing patch panels or something like Middle Atlantic's BR1 brush grommet panel to cleanly get cables out of the rack and into the network switch. One aspect of poor rack building that I frequently see is a bunch of small pieces of equipment stuffed in the back of a rack. Just because they don't have rack ears on them doesn't mean they should just be free floating inside the rack. Incorporate a couple internal rack shelves to secure all of your small items like twisted pair transmitters/receivers, distribution amplifiers, scalers, converters, power supplies, etc. 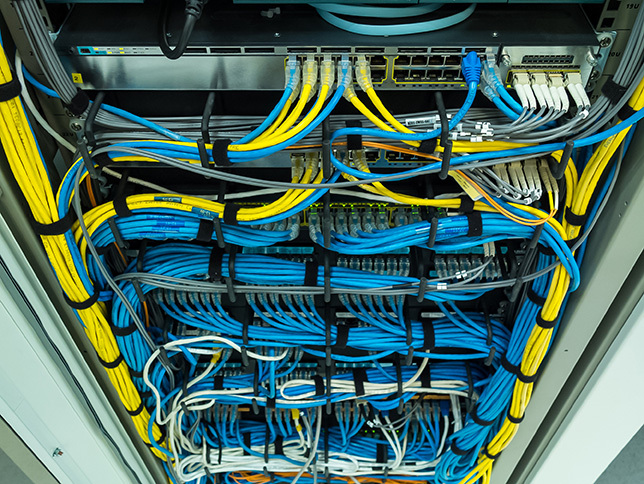 Related to the cable management discussion above, properly dressing cables inside a rack will also help free up equipment access during those troubleshooting situations. Having clear access to the back of all pieces of equipment is key. That being said, don't go overboard with horizontal lacing bars, which can make it hard to reach inside the rack. Power management is often overlooked by rack designers. A few power strips free floating inside the bottom of the rack can make for a messy install. There are quite a few UPS and horizontal/vertical power strip options that can be mounted to the rack to clean things up. Some power distribution solutions even have IP, serial or relay control options to remotely power cycle rack equipment. Specifying the proper number and type of these rack-mounted power distribution units will help you avoid fire code violations like daisy chaining power strips or using extension cords. Anyone who has designed or built a rack can tell you that those power supply bricks can be a real pain in the rear. They take up room inside the rack and on your power strips, and if you don't devote a shelf or two to just power supplies, they can really get in the way. Sometimes you just have way too many power supplies to deal with in a rack. Those are situations where a DC power distribution box comes in handy. Installing a product like the Middle Atlantic PD-DC-125R or the TechLogix Networx TL-RKPS-01 allows you to eliminate the individual power supplies and feed typical DC voltages (5V, 12V, 18V and 24V) to your equipment. They're not cheap, but very handy for those packed racks. Every campus is subject to AV equipment theft. There's thousands of dollars of AV equipment sitting unattended in each classroom, and some small steps can prevent that equipment from "walking off." Using rack screws that require a security bit will slow down thieves who only have a Phillips head screwdriver with them. Equipment that doesn't have rack ears needs to be secured with at least clamping shelves to hold it down. Locking rack drawers can prevent wireless mics from disappearing, and locking rear rack doors keeps the general public out of your rack. Rack security doesn't necessarily pertain just to theft. Perforated security covers, for example, will prevent general users from adjusting equipment settings on equipment with front-facing buttons and knobs. Fill all empty rack spaces with blank or vent panels so users aren't able to reach inside your rack and disconnect cables, store their belongings, power cycle equipment, etc. There's no denying that heat kills AV equipment. Cramming all of our AV equipment into a metal rack with front and rear doors can really be a bad thing, unless you take some time to focus on thermal management. Prolong the life of your equipment by paying attention to your equipment's heat output, active/passive rack venting and cooling options, airflow around the rack, and AV closet HVAC solutions. This is one of those areas where an experienced AV system designer is needed to specify all the correct rack components and infrastructure considerations early in the project's timeline. Proper rack thermal management could easily be a series of articles, but Middle Atlantic has written a nice white paper outlining many of these concepts.